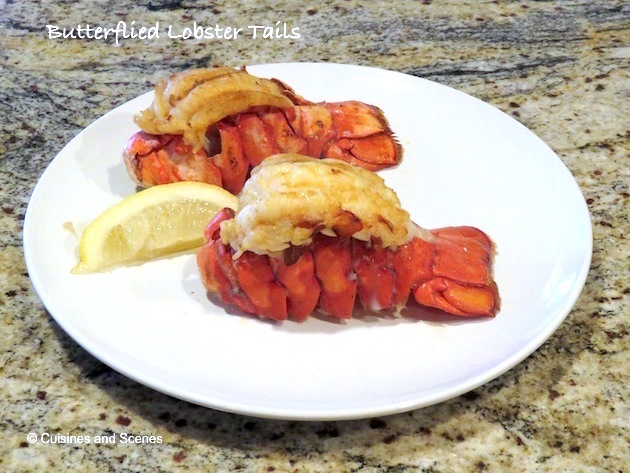 Have you often walked by the seafood counter at your supermarket, looked at the lobster tails on sale, and thought, “If I only knew how to make them?” Well, wonder no more! I’m here to show you an elegant way to prepare this delicacy. It’s a bit tricky the first time or two, but practice makes perfect, and before long you will be serving this restaurant-worthy dish. My starting point was the Lobster Help website’s Butterflying Lobster Tails page. 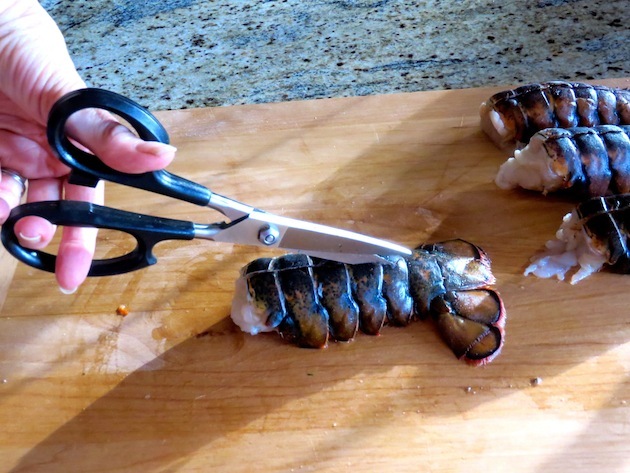 The first step is to use kitchen shears to cut through the shell–but not the meat–all the way to the tail “fans”. Next, gently pull apart the shell and separate it from the meat. Carefully lift up the meat and push together the shell under it. Press the shell back together and lay the lobster tail on top. Place on a broiler pan, drizzle with melted butter, and broil based on weight. Watch them carefully, as you don’t want to overcook them and end up with rubbery lobster! In just a few minutes, you’ll be ready to enjoy your gourmet treat. Wine pairing: Because of the richness of the lobster and butter, we like to serve a crisp Sauvignon Blanc, such as those from the Marlborough region of New Zealand. Various wine sites describe these wines as being minerally and herbaceous, with flavors of gooseberry, passion fruit, and tropical fruit, and citrus overtones. Whether or not you agree depends on your taste buds! Kim Crawford and Brancott are two reliable brands with widespread availability; Whitehaven, Giesen, Nobilo and Matua are also popular. However, you can’t go wrong with most Marlborough Sauvignon Blancs. I’ve yet to have one that I didn’t like! What’s your favorite type of seafood? What wine do you like with it? Tell us in your comments! An attractive way to prepare this special treat! Adapted from LobsterHelp.com's step by step instructions. It seems intimidating but won't be once you try it. 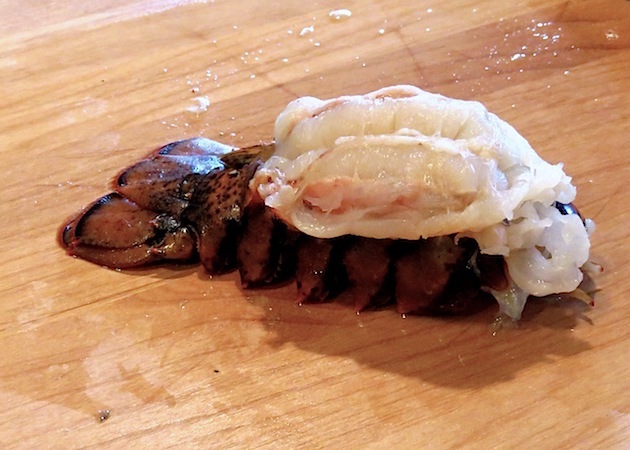 Place lobster tails on a cutting board. With kitchen shears, slip the bottom blade under the shell and cut down to the end, where the shell fans out. Cut only the shell and not the lobster meat. 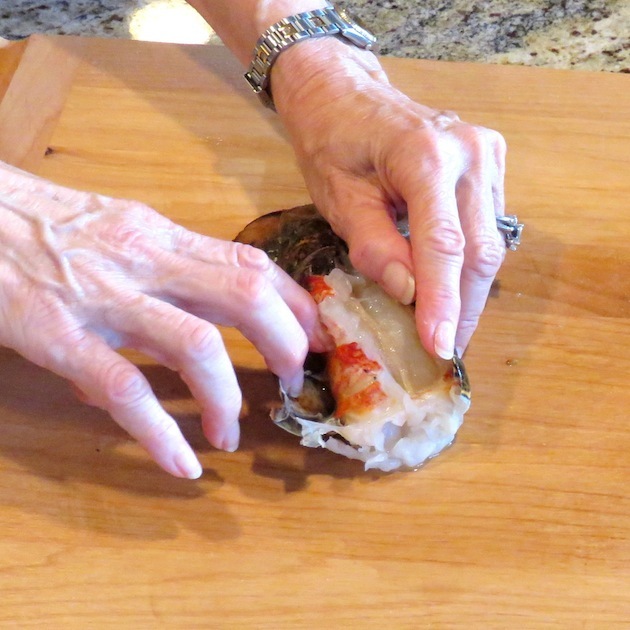 With your fingers under the center cut, carefully pull apart the shell and separate it from the meat along each side. Do not separate the meat from the shell at the "fan" end. 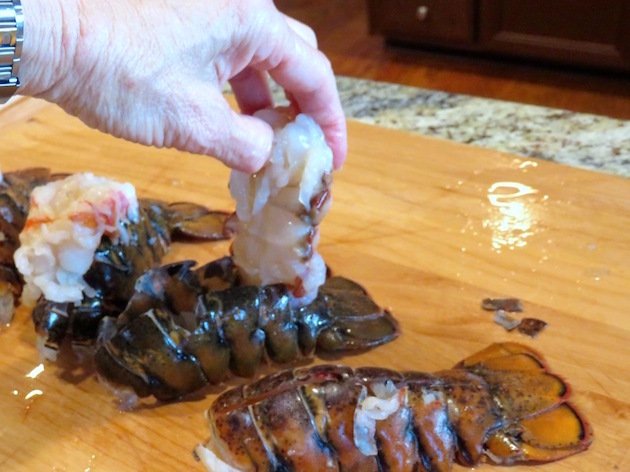 Gently lift up the lobster meat, press the shell together, and set the meat on top of the shell. Cute a shallow slit along the top of the meat and fold it outward over the shell. If desired, you can cut another slit on each side of the center cut. 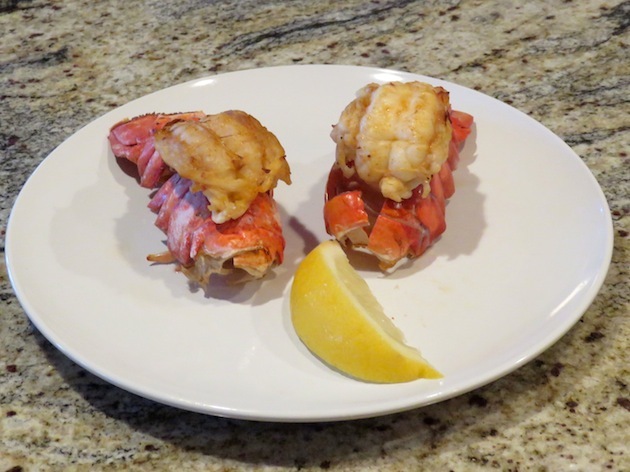 Place lobster tails on a broiler pan. Combine melted butter and seasonings and baste lobster tails. Broil for about 1 minute per ounce (i.e., for a 5 ounce tail, 5 minutes) until firm, opaque, and lightly browned. Watch them carefully so they don't burn; it's easy to overcook them. Serve with lemon slices and additional melted butter if desired. The amount of melted butter, lemon juice, and other flavorings depends on the size and number of lobster tails. Actual cooking time depends on weight of tails and how close to the broiler you have the oven rack. The lobster tails cook quickly, so keep an eye on them so you don't overcook them. 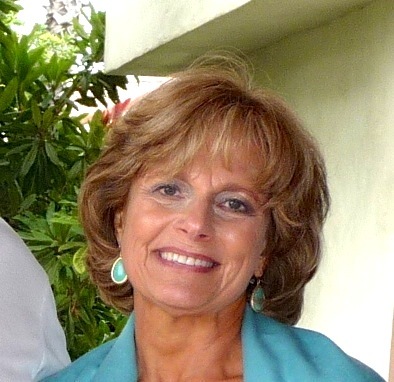 Hi Marlene! Thanks so much for stopping by my blog. Dropping in to say hello! These lobster tails look wonderful! I don’t make this sort of seafood often enough! I need to change that. Your method is perfect for beautifully broiled tails. Welcome, Renee, you are my first commenter! Thanks. I pinned those muffins to make soon. Yummy! My husband made lobster tails this past weekend but we didn’t know how to make them look pretty by sitting above the shell. Thanks for the step by step photos and instructions, this is perfect! Glad you found the post helpful, Sharon! Once you’ve done it, it’s pretty easy. Enjoy!